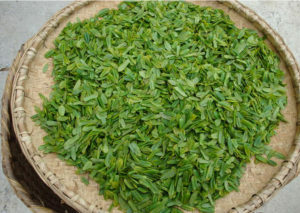 Liu An Gua Pian is one of Chinese Ten Famous Tea. And this tea might be the most laboring-cost one among Chinese teas. Its hand-made processing last around half a month to finish, which involves in a lot of artistic and torturing work. In Qing Dynasty, it is a precious tribute tea to the royal members. While due to its rareness, it is limited supply to a few members. When the historically famous Empress Cixi. was the highest-ranking imperial concubine she was not qualified to enjoy the tribute. 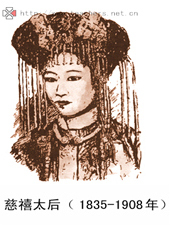 Till later she gave birth to the crown prince, she got a supply of around two pounds of Liu An Gua Pian each month. It’s originated from the Bat Cave of Qishan, Liu An Region of Anhui Province.This tea is special in its appearance. It looks a bit like watermelon seed. And so it’s named after. In its processing, the buds and stalk was removed, only leaves left. 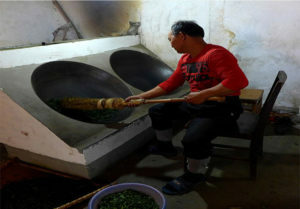 Unlike most of other Chinese famous green teas which is frying dry, Liu An Gua Pian needs three times of baking dry on bamboo basket which is the unique and key processing in forming the quality of Liu An Gua Pian. 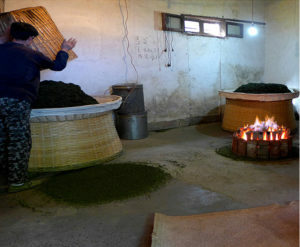 Especially the last time of baking is extremely heavy work and critical to the tea quality. The finished product Liu An Gua Pian is jade green color and covered with a thin layer of white frost. It has very strong fragrance when brewing, and the taste is very mellow sweet. 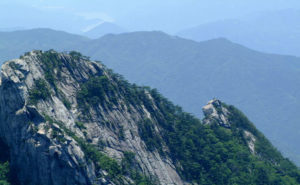 Liu An Gua Pian is produced in Qishan Mountain of Southwest Anhui. 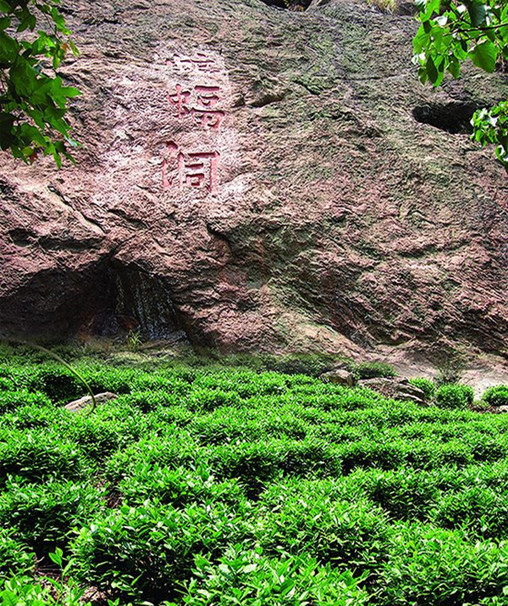 And the tea garden in front of the Bat Cave is considered as the most pioneering tea garden in Qishan region. This is the special way of plucking of Liu An Gua Pian. 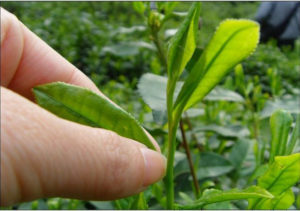 Only leaf is plucked, without buds and stalk. The newly plucked fresh leaves are put on the bamboo plate for slight withering. 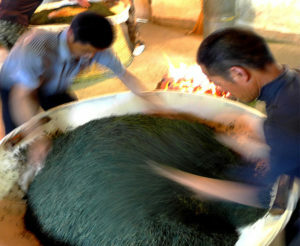 After slight withering, the tea leaves will be sent for frying. Liu An Gua Pian is special in that it needs frying （杀青）for two times, this is the fist time frying-Chao sheng guo 炒生锅, in this processing the temperature of pan will control at around 100℃. In the second time frying-Chao shu guo 炒熟锅, the temperature is lower at around 80℃. 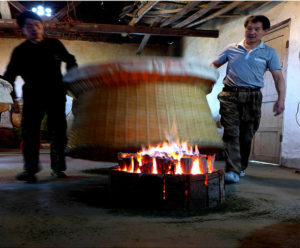 During the second time frying, the tea is also rolled at the same time. After the two times of frying, the water content of leaves is around 30%. Then the tea will go for baking. First time baking-La Mao Huo 拉毛火. 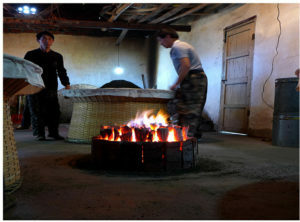 In this processing the already fried tea leaf was put on the bamboo basket, and charcoal burning for heat. The temperature on the basket surface in this processing is around 100℃. 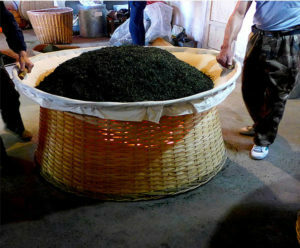 when the tea is too hot, the basket need move away from the heat to cool down and the tea need to turn and stir. After that, the basket was put on the heat again. 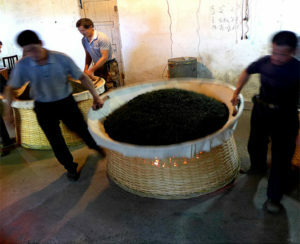 This handling will repeat for several times till the water content of tea leaves is around 15%. One other critical requirement during the baking processing is that no any smoke should be occurred from the heat. otherwise the smoke will be absorbed by the tea, and the tea quality will be spoiled. 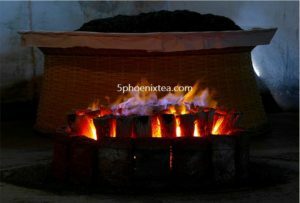 The second baking-La Xiao Huo 拉小火, in this processing the temperature on the basket rise to around 120℃. And the basket can be just put on the heat for around ten seconds. Then it will be moved away for putting another basket. The tea on the moved-away basket is stirred and got a bit cooling down. Then it will soon be sent for another time heating. 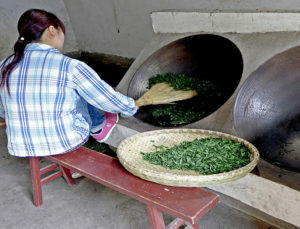 This handling will repeat for 40-50 times till the water content of tea leaves is around 10%. In the whole work, it should be very careful on temperature to avoid any burning. After the second baking, the tea will be put aside for 3-5 days to recover some natural moisture, waiting for the last time baking. Last time baking-La Lao Huo 拉老火. This is the most critical and heavy-work processing of Liu An Gua Pian. In this baking, the temperature on the surface of the basket rise to 160-180℃. 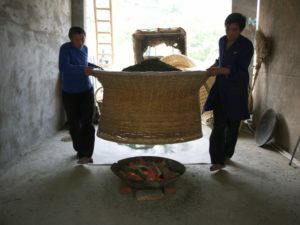 The basket with tea can only be put on the heat for 1-2 seconds, then immediately moved away for stirring and cooling down. This work will repeat around 100 times. A few baskets are arranged in turn for the processing and a team of workers is required to coordinate to operate them at the same time. 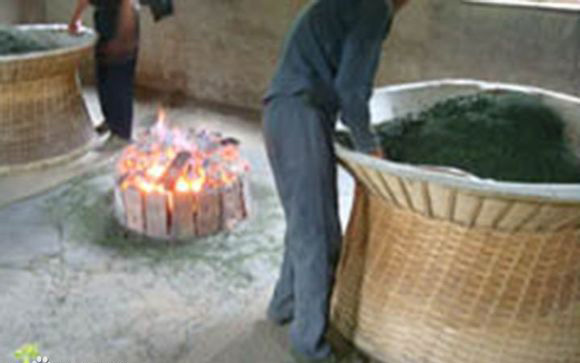 It needs quite agile and careful handling experience to avoid burning of teas. 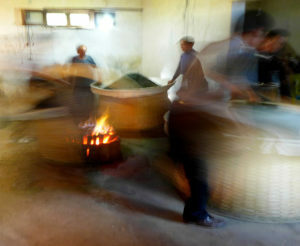 In the last stage of the processing the tea will turn on a white frost look on the surface of the tea. 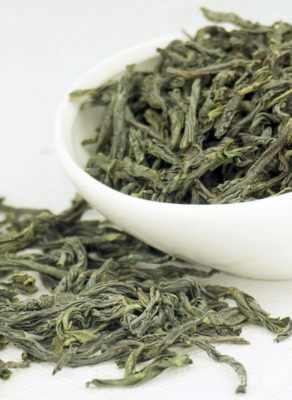 (Which is one important character and reference of tea quality of Liu An Gua Pian). 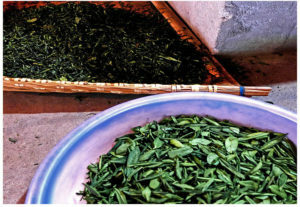 The processing will lower the water content of tea leaves to 4-5%. 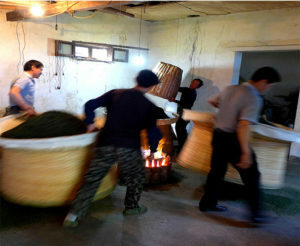 The finished tea is packed into iron drums and sealed immediately after the baking when the tea is still hot. This is the finished product Liu An Gua Pian after the whole processing. 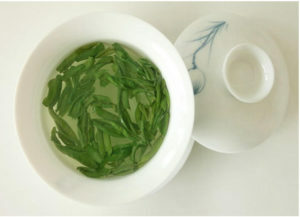 There is a cover of white frost on the surface of dry tea which is the unique character of Liu An Gua Pian.